...it's always tea-time...: LEARNING TO IRON. 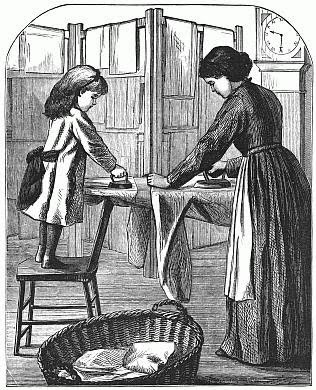 "Now I've had my lesson in my 'Nursery Primer,'" said little five-year-old Ellen, "and I want to learn to iron clothes." "You are rather too young to be trusted with a flat-iron," said her mother: "you might burn your fingers." "I'll promise not to cry if I do," said Ellen. "Please let me go out and help Patience iron, mamma." Mamma at last gave her consent; and our picture of Ellen and Patience at work at the ironing-board gives about as good likenesses of the two as their reflections in a mirror could have given. Ellen saw how Patience used her flat-iron, and then used hers in the same way. She ironed a towel so well, that Patience praised her, and said she could not have done it better herself. But, as she was trying to put a flat-iron on the stove, Ellen burnt her fingers so as to make her hop. She did not cry; for she remembered her promise. Patience wet a cloth with cold water, and put it on the burn; then she remembered that common brown soap was the best thing for a burn, so she spread some soap on a cotton rag and put that on. Soon the pain was gone, and Ellen ran and told her mother what had happened. "You should not have tried to put the flat-iron on the stove," said her mother. "If your clothes had caught fire, you might have had a bad time." "Would my dress have blazed up?" asked Ellen. "I take care to dip your clothes in a weak solution of nitre before they are worn; for that prevents their blazing, even if they should catch fire," said mamma. "But you must not let that keep you from taking great care." "Next Tuesday may I take another lesson in ironing?" asked Ellen. "Yes: if you say your lessons well during the week, you shall not only learn to iron your clothes, but to wash them." "That will be fun!" cried Ellen, clapping her hands, and quite forgetting her burnt finger. Den hårda vägen, eller den brända i det här fallet. En härlig historia om hur man får erfarenhet av det praktiska livet. Nu för tiden är jag inte så säker på att alla barn får lära sig praktiska sysslor på det här sättet. Du kan väl ge några synpunkter på det du läst, så hakar jag på! I think I need those lessons! Hope you did learn something from this article!